The cadherins are a family of cell-surface receptors that form calcium-dependent homophilic interactions between the surfaces of adjacent cells. These interactions result in the formation of intercellular adhesions, adherens junctions, which play essential roles in the establishment and maintenance of cell polarity and tissue architecture and in the recognition and migratory events associated with developmental and morphological processes. These adhesive interactions are supported by a catenin-mediated linkage to the underlying actin cytoskeleton, as the carboxy-terminal cytoplasmic tail of cadherin binds P-catenin, and via an interaction with a-catenin is linked to the cortical actin network (Fig. 2) (see Conacci-Sorrell et al. and references therein). The importance of this cytoskeletal connection is highlighted by the observation that disruption of normal catenin function prevents the formation of mature adherens junctions and is associated with increased motility and invasiveness of tumor cells (reviewed in Okegawa et al. ). Figure 2 Adherens junctions and cadherin function. (A) Schematic of adherens junction organization and associated signaling pathways. The catenins provide a direct physical linkage between the homophilic cadherin-mediated cell-cell contacts and the underlying actin cytoskeleton and support the integrity of the adherens junctions. In turn, the actin cytoskeleton provides P-catenin docking sites that serve to modulate P-catenin signaling by buffering the soluble concentration of P-catenin. (Adapted from Conacci-Sorrell, M. et al., J. Clin. Invest. 109, 987-991, 2002.) (B) Structure of C-cadherin showing the arched arrangement formed by the five individual cadherin domains (EC1-EC5) and a model for the trans (cell-cell) interaction from abutting EC1 domains. Two orthogonal views are shown, with the arched nature of the structure evident in the right figure. (C) A model of the trans and cis interactions at the adherens junction based on contacts present in the C-cadherin crystal structure. In this model, the individual cadherin molecules in the adherens junction are tilted by ~45° with respect to the plasma membrane, implying an intermembrane separation of ~245 A.
invasion, including Myc, cyclin D1, metalloproteinases, and fibronectin . 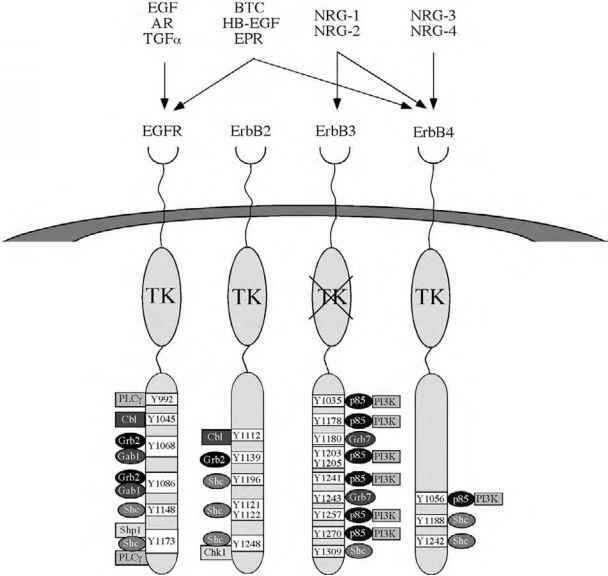 A number of regulatory mechanisms modulate P-catenin signaling. In the absence of Wnt signaling, cytoplasmically disposed soluble P-catenin is a substrate for phosphorylation by glycogen synthase phosphorylase, which serves to mark it for degradation by the 26S protea-some; however, activation of the Wnt pathway inhibits this phosphorylation and P-catenin is shunted to the nucleus, where it forms a complex with the T-cell factor (TCF) to activate selected genes. The formation of normal adherens junctions appears critical for control of P-catenin signaling, as a loss of cadherin expression correlates with increased nuclear P-catenin. Thus, there appears to be a close linkage between cadherin-mediated adhesion and P-catenin-mediated signaling pathways, with the adherens junction acting as a buffer of soluble P-catenin (Fig. 2) . Structural studies have suggested several models for the homophilic adhesive interactions formed by the cadherins at adherens junctions. The recent report of the structure of the entire extracellular domain of C-cadherin by Boggon, et al.21 provides new insights into both the cis (intracellular) and trans (intercellular) interactions that are essential for the formation and maintenance of adherens junctions (Fig. 2). The structure shows that the five extracellular cadherin domains (EC1-EC5) form an arched structure, and the abutment of two N-terminal EC1 domains in the crystal provides a model for the trans adhesive interaction. Additional crystal contacts suggest a model of the cis contact, and together the interactions observed in the crystalline state provide a detailed model for the periodic organization of cadherin molecules within the adherens junction. Of particular note is the suggestion that the cadherin molecules in the adherens junction are tilted by ~ 45° with respect to the plasma membrane, implying an intermembrane separation of ~245 Â. This feature of the model is particularly noteworthy, as there is a strong bias to view intrinsic membrane proteins as projecting perpendicular to the plane of the plasma membrane; a priori there is no fundamental reason for this assumption.